I wrote a short story. Yes, I know, that's not exactly shocking since I'm an author and there's even a short story floating around somewhere on this blog. But actually, yeah, it's a bit more peculiar than you'd think. Short story writing is not easy and it's not something that is given anywhere near enough respect these days. Shocking, really, in this age of short attention spans. Personally, I keep a well-stocked collection of short works on my Kindle specifically for those moments when I find myself in need of a distraction from boredom, but I don't have enough time to invest myself in a longer work. But this little story... Well, you'll see. Chevelle Falsetto has died, struck down by the number 48 bus. The very bus she should have been riding to work. Now, instead of explaining to her boss why she's late, Chevelle finds herself explaining to Saint Peter why she's early. This is a curious little work. It's barely a story, weighing in at a measly six thousand words (for perspective, The Eyes of The Sun is over 100k words and each Discordant novel is roughly 50k). It's not sci-fi, it's not even fantasy, and it only brushes lightly against the humor category. Even weirder, it's vaguely religious and in a way that is surely going to lose me favor with those would interpret my interpretations of the Christian afterlife as blasphemous. And it all started with a dream. I've heard people say they've dreamed up plots in their sleep. Stephanie Meyer famously commented that Twilight was based on a dream. My good friend and author Ann Livi Andrews has on more than one occasion relayed to me dreams that were so intricate, thought out, and coherent that I had to ask what she eats before she goes to sleep. Me? I dream about hiding out in a dishwasher because our fish overlords are on a rampage. Oh, and I'm out of lemon Pledge, which will surely be a grave disappointment to the skeleton dance troupe I'm supposed to be visiting. But this one night, I didn't dream of a plot, but a title. All the nothing we've done was apparently a running theme in a dream. I don't remember the details, if there were in fact details to remember. 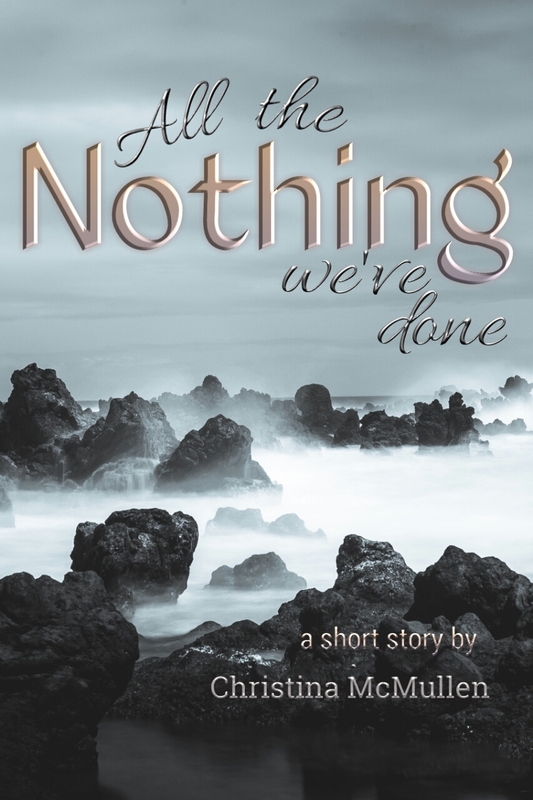 So I wrote it down (actually, what I wrote was 'All of the nothing we did' but I tweaked a little), thinking it was something I may or may not explore at a later date. Well, it kept bugging me. And bugging me. And eventually, I had these little plot bunnies jumping around in my head, which was not ideal, seeing as I was trying to finish up what would eventually be the first draft of a story I've been working on for years now. And like everything I ever thought I was going to write, those plot bunnies were tossed out the window when I finally sat down and got to work. Instead, I kept coming back to my twenties, also known here as my pretentious years. At the time, I was convinced I was going to take the world by storm and become the next great American novelist. I was also insecure as all get out and considered myself a ginormous failure as a human because I had no traditional 'accomplishments' to my name. Yet every so often, I'd have these moments. Not necessarily moments of clarity, but moments of acceptance, I think, where I would think about all of the positives in my life and how much better off I was for deriving simple pleasures in an otherwise complicated existence. Chevelle is the manifestation of those moments. She's someone I never truly was, which is perhaps a good thing as who I was and who I am are not even remotely close, yet so very intrinsically intertwined. But Chevelle is also someone who will never have a chance to be who I now am. But who's to say she would have ever followed this path anyway? I assure, you, despite everything above, and despite the fact that I really had no choice but to place this book into the category of literary fiction, it is not anywhere near as pretentious as it would have been had I attempted to write it twenty years ago. In fact, there's a damned good possibility that in writing this story, I've inadvertently parodied my younger self. Regardless, I hope you enjoy reading. I cannot wait.... I just was looking at a piece you did in college about a girl in a coffee shop, and of course Jack Kero however you spell his name. I can't wait either. But I'm cheap, so I will.